The current Technology Radar has 94 items. It’s important to understand that this is not a complete list of all available technologies. The input for ThoughtWorks Technology Radar comes from the 2500 employees of ThoughtWorks. The final cut is made by the ThoughtWorks Technology Advisory Board, which has only 20 members, including Martin Fowler, Rebecca Parsons, Erik Doernenburg and 17 other very smart ThoughtWorkers. They have to master the difficult process of deciding which technology appears on the radar and in which quadrant. From a couple hundred technologies they have to cut down to ~ 100. You can download the full report as PDF. ThoughtWorks is organizing events to the Technology Radar, where they present and discuss their decisions with the audience. You can check out the upcoming events here. I attended to the Technology Radar event in Hamburg. Which was a lot of fun. The following section is a report of my personal experience in Hamburg. Last week I was invited to the launch Party of Graylog2 version 0.20.1, the market leader for searchable logs. By accident I noticed on Twitter that ThoughtWorks is organizing a Technology Radar event in Hamburg just the day after the Graylog2 launch Party. 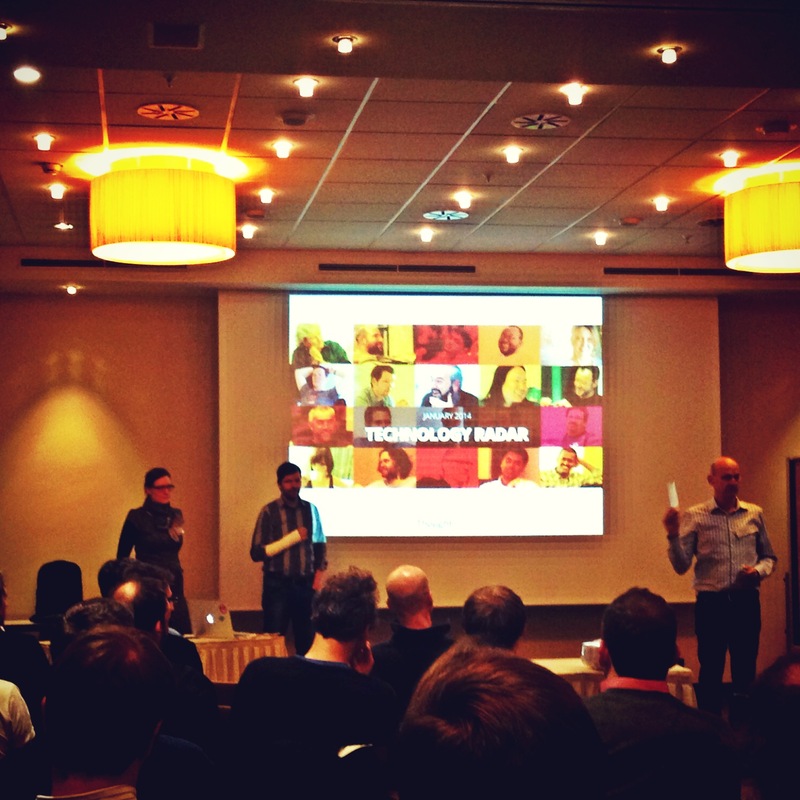 I decided it’s worth it to stay 1 day longer in Hamburg and join the ThoughtWorks event. It makes specially sense for me because I’m working on VersionEye and I have to deal every day with all kind of technologies. The event started 7pm at the Lindner Hotel. Erik Doernenburg explained the decision making process and presented the highlights from the different parts of the Radar. The HOLD section is maybe the most interesting section on the Radar. JSF is on HOLD. I worked 3 years with JSF and I’m wondering why it took so long to put in on HOLD. JSF is by default not web friendly. By default you have problems with bookmarking, the browser back button, multiple tabs and it’s eating memory like a black hole because you have to put everything in session scope. Good luck with that if you have to build something for the Internet. TFS is on HOLD too. Team Foundation Server from Microsoft. It’s such a good product that Microsoft gives it away for free if you buy anything else. But it’s still not fun to use it. And it is far away from the open source alternative Git. Heavyweight test tools. How do you know if you are using a heavyweight test tool? There is a simple test for that. If you can get certified for it, its heavy! If you need a workshop to learn it, its’ heavy! If you need to pay a lot of Money for it, it’s heavy! Let me know what you think about the Technology Radar.